Ayrshire Ladies County Golf Association: Connie Jaffrey - Scottish Amature Champion 2017! 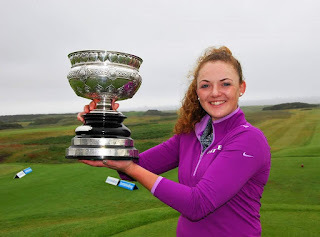 Connie used a brilliant short game and excellent putting to surge five up at the turn, having gone out in four under par with birdies at the first, fourth, sixth and ninth. Clara Young did not win a hole until the 11th but it triggered off a two-under-par run which saw her also win the 12th, 13th, 14th and 15th - five in a row, a magnificent fightback which saw her square the match on the 15th. However the miserable weather saw to Clara's rally petered out. She bogeyed the 16th to go one down again and then was plugged in the thick and wet rough with her second shot at the 18th, moving the ball only a few feet, and eventually conceded a 10ft birdie putt to go down by two holes. Well done Connie! We are all very proud of you and good luck next week!